In the past two years, Twitter has firmly established itself as a powerful social media marketing tool. Countless companies, from major corporations to small business owners, routinely take advantage of all of the free and paid marketing opportunities that Twitter has to offer. Various large corporations – everyone from McDonalds to Samsung to Lexus – have purchased their way on to millions of Twitter users’ feeds through “promoted tweets” or “promoted trends.” This form of advertising is a great way for big brand names to spread the release of a new product or campaign. While these millions of consumers have no choice but to see the material, the tweet and trending topic formats make them seem less like invasive ads and more like part of the normal Twitter landscape. 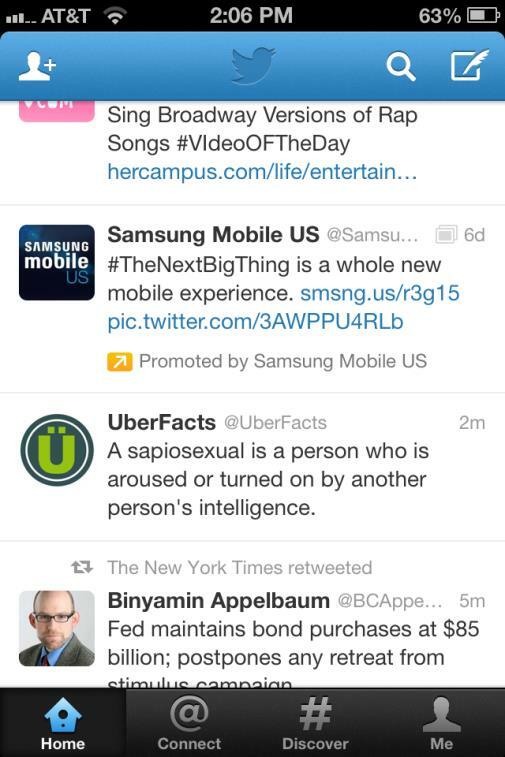 This Twitter feed shows a promoted Tweet from Samsung Mobile. The company is trying to spread the hashtag “#TheNextBigThing” as a way to stimulate sales of their new product. The second form of Twitter marketing – which is completely free – is when companies create their own Twitter handles or develop brand-centric hashtags to generate buzz about their products or services. The hope is that the account will garner tons of followers or that the hashtag will start trending. More interest = more business. This practice has been used since day one of Twitter’s reign by large and small businesses alike. It recently reached new heights with trends like second screen use and social television. Using a second screen while watching television has become so commonplace that tablets are truly an essential TV accessory. In case you’re unfamiliar with these terms, here’s a quick rundown. A second screen, sometimes called a companion device, refers to any additional electronic device (usually tablets, smartphones, and laptops) that allows a content consumer to interact with the content they are consuming – like television shows, movies, or video games. Social television is the concept that drives the need for a second screen; it is the technology that supports communication and social interaction in the context of watching television, or related to TV content. Social media platforms like Twitter and Facebook are prime examples of the technologies behind social television. In just the last year, TV watchers have taken Twitter by storm to chat about what they see on TV. Consumers are on their second screens while watching everything from new episodes of a TV series to major televised sports events. “Live-tweeting” broadcasts are now typical. Major TV moments are trending topics on Twitter for days. While much of the Twitter buzz surrounding these TV events is completely user-generated, television networks have also picked up on the major opportunity that lies in social television –taking complete advantage. Twitter itself encourages networks to create accounts for all of their hit shows. Networks like ABC display their shows’ Twitter handles onscreen throughout episodes as a way to make viewers aware of the Twitter presence. Once they begin to garner followers, the network uses these popular accounts in a variety of ways. 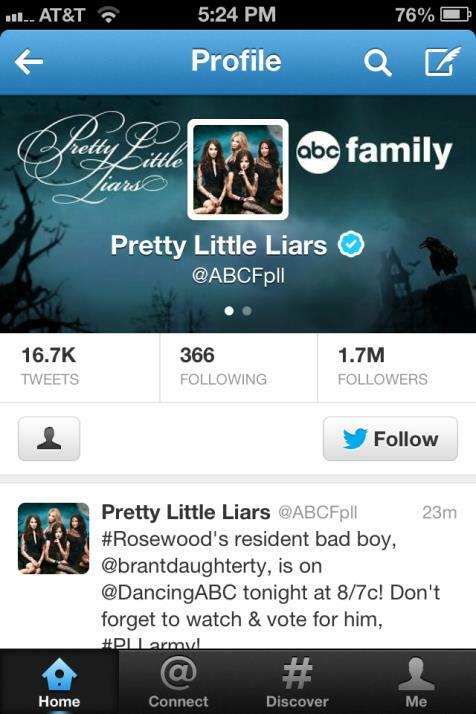 ABC successfully used social television to their advantage when they created a Twitter account for their hit series “Pretty Little Liars” – @ABCFpll. As the image shows, the account has 1.7 million followers. In the above tweet, ABC uses this extremely popular account to promote another ABC show – “Dancing with the Stars” which uses the handle @DancingABC. ABC’s account @ABCFpll is an example of a successful marketing tool driving social television- and thus driving more viewers. In fact, Nielsen’s SocialGuide declared Pretty Little Liars the #1 most-tweeted TV series of last year, with the March finale generating the most social media buzz in TV history. How do they do it? First of all, ABC tweets frequently from this account leading up to new episodes as a way to raise excitement and therefore increase viewership. Another way they generate buzz is by interacting with celebrities. The shows’ stars all have their own Twitter handles, and frequently respond to tweets from the show’s main account – a tactic which majorly drives followers. Additionally, the network will promote the entire series, certain episodes, or even specific moments within an episode by tweeting with precise hashtags, as well as showing those hashtags onscreen during major moments in the episodes. As shown above, ABC also successfully uses their popular account to promote other shows – a method that definitely succeeded with the newer ABC series Scandal. ABC first used existing accounts such as @ABCFpll to generate interest in the new show back in its first season. Then, in between the first and second season, ABC launched Scandal‘s own Twitter campaign with the handle @ScandalABC. Now the account has gained hundreds of thousands of followers who live-tweet every episode, as well as a major increase in viewership. Perhaps the campaign is the reason for the mass increase in viewers between the seasons. 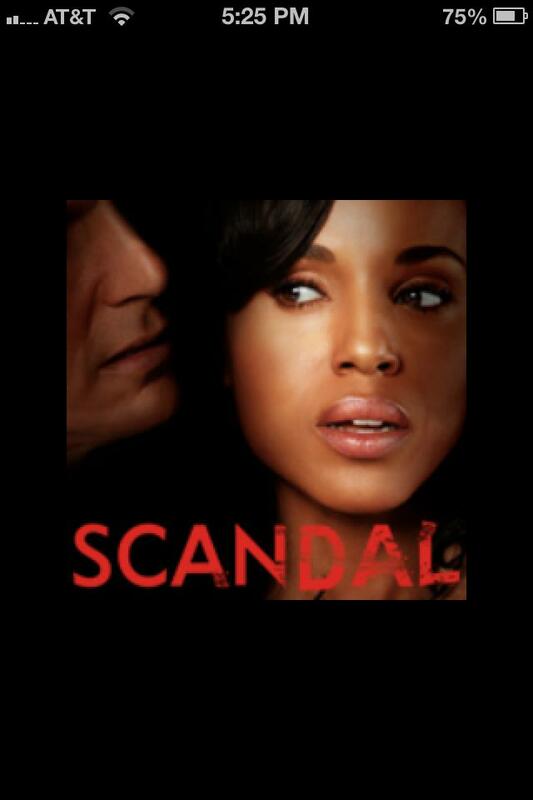 The above photo is the main picture for the ABC Scandal twitter handle, @ScandalABC. It has been clear for a while that Twitter is a social media platform which presents major marketing prospects for all types of businesses. With the growth of social television, TV networks are now fully involved in all the Twitter action, thus further proving the versatility and opportunity that lies in social media marketing. Considering their great success, it is doubtful this trend will slow any time soon.